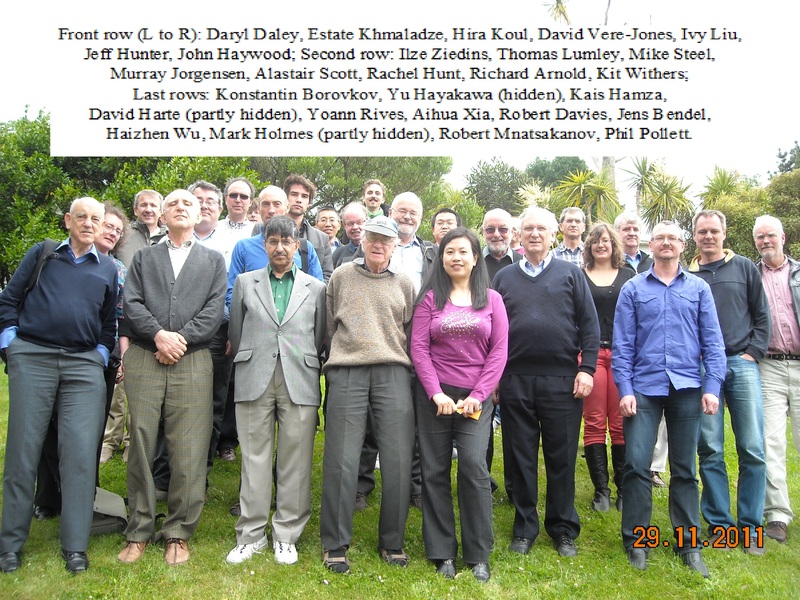 The Fourth Wellington Workshop in Probability and Mathematical Statistics (WWPMS4) will be held at Victoria University of Wellington on 2-3 December 2013, in room LB LT118 (ground floor of Laby building, Lecture Theatre 118). Here is a map of the Kelburn campus (pdf), on which Laby building is at grid reference h11. Here is some useful additional information on travel and accommodation, including various other maps. There is no fee to attend the workshop, but we do require all speakers and attendees to register for catering purposes please - by 15 November 2013. Registrations have now closed, but for any further queries concerning the registration process please contact John.Haywood@vuw.ac.nz. The programme, as at 30 November 2013, is available: Workshop Programme. There have been a few changes to the times of certain talks, so please refer to this latest version of the programme. All participants will receive a printed copy at the workshop. Please note the Workshop Dinner is now confirmed for 7pm onwards on Monday 2 December at Shed 5, Queens Wharf, Wellington. Titles and abstracts, as at 13 November 2013, are available: Workshop Abstracts. The Workshop is dedicated to advances in mathematical theory with an accent on beauty and clarity, rather than technicality. Good explanations of heuristics are very welcome, as well as interesting applications, even if not fully developed mathematically. A large part of all talks should be accessible to good postgraduate students. This year the Program Committee was extended to stress the national character of the workshop. The full committee is listed below. The Organising Committee Chair is: John Haywood. Please direct all enquiries concerning local arrangements to John.Haywood@vuw.ac.nz.